I should probably preface this post by stating that running the Colour Run was probably one of the dumbest decisions I've ever made. Listen to your body when you're feeling unwell. Learn from my mistakes, pushing yourself will only lead to hospital stays and increased medical debts. I find it more motivation to train and workout when I know I have an event coming up. The fun runs, Spartan races and timed runs are great motivators for me to pick my lazy booty off the couch and go work out. 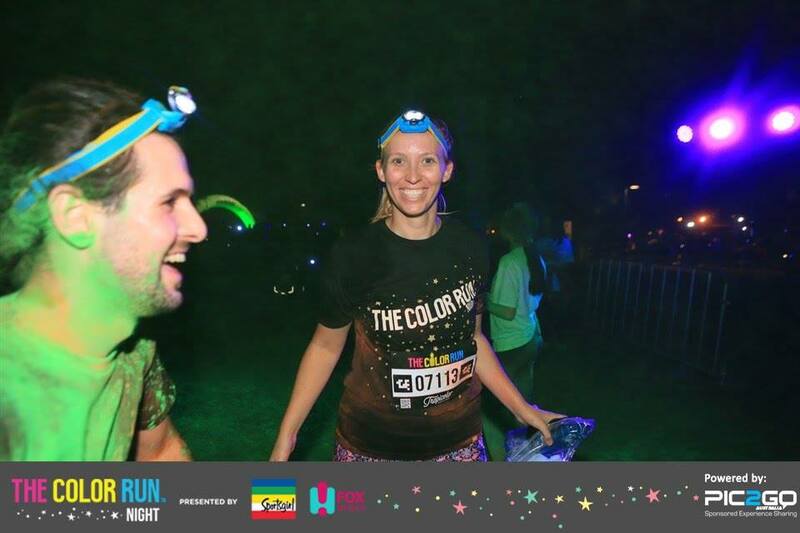 The Colour Night Run was the perfect motivator to continue running but still, have heaps of fun. This race is almost the same to the daytime run except it's at night (wow shocker I know!!). 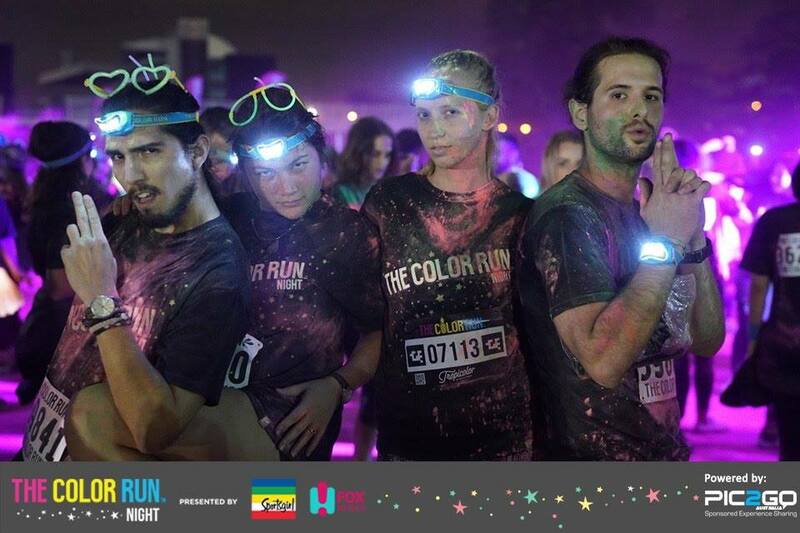 All of the colour powders respond to black light, so your colours glow as you run. 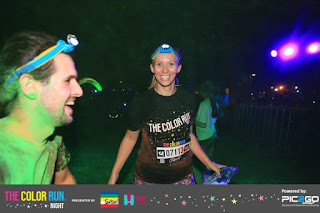 Your race packet included a glow in the dark t-shirt, a couple of glow in the dark tattoos, and a nifty head lamp (so klutzes like me don't trip and break their neck). Unlike most of the races I run, I managed to wrangle up a group of friends to join in! I could not be more grateful for the fact I had other people there with me. It was so much fun, running around like silly children while knowing if I got sick, there were people there who could call an ambulance for me. 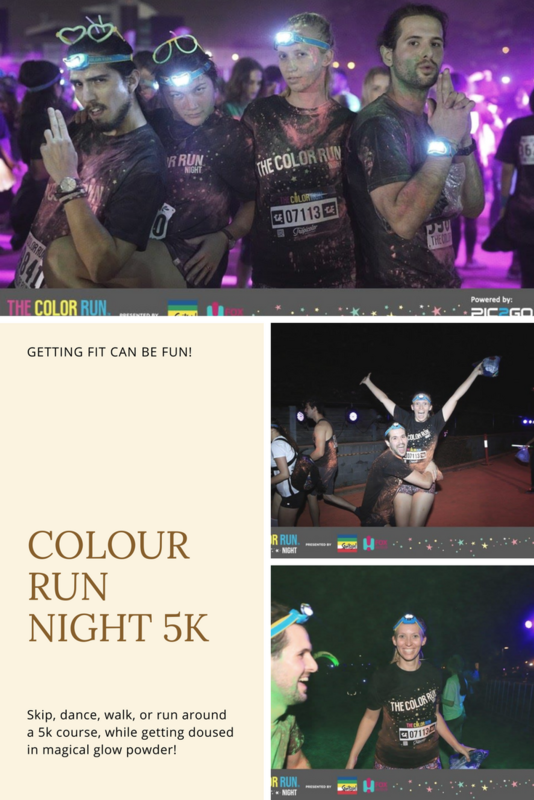 We galloped and sprinted through the various colour sections, making sure to stop and smile for the cameras. We laughed, we ran, we attempted to be fit, and we almost finished without falling over. The best part of the fun runs, they aren't timed. It does matter what level of physical fitness you're in; you can take as long as your heart desires to complete the race. If you've ever wanted to run a 5k but were too afraid, I would highly recommend running in a fun run. This way you can get out there, have heaps of fun and complete your goal! Next thing you'll know, you'll be on your way to your first marathon. 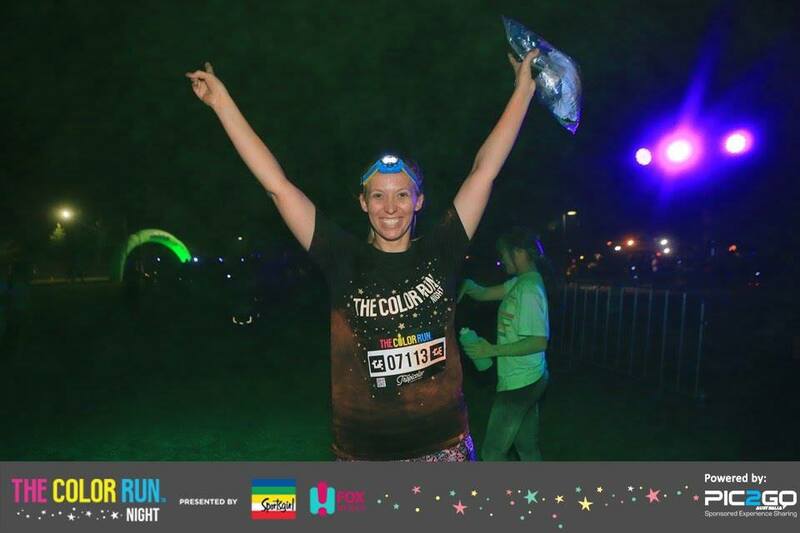 Have you ever ran the Colour Run or any other fun runs? Tell us all about it in the comments below! How fun is this?! I have heard of a color run and have ran a night run, but never the combination! Great tips! It was so much fun! I highly recommend it. It definitely is more motivating to run in with a group of friends. I too am not big on running but find it is a great mental and physical challenge for myself. I've always thought it would be fun to do a color run! Looks like you had such an awesome time! I'm embarrassed to admit, I have not participated in a run . . . unless I walked (like Race for the Cure) or worked a water station. You make me feel like a bum! What a fun experience! Great photos, love all the colored powder! What a cool race!! That is such a fun way to get exercise done right. I have never heard of this before, I might have to check to see if they have one in my area. Looks like you had so much fun. I have friends who participate in this kind of race too, but I have not tried. I am not sure if I have the stamina to last lol. But maybe a little preparation will help.